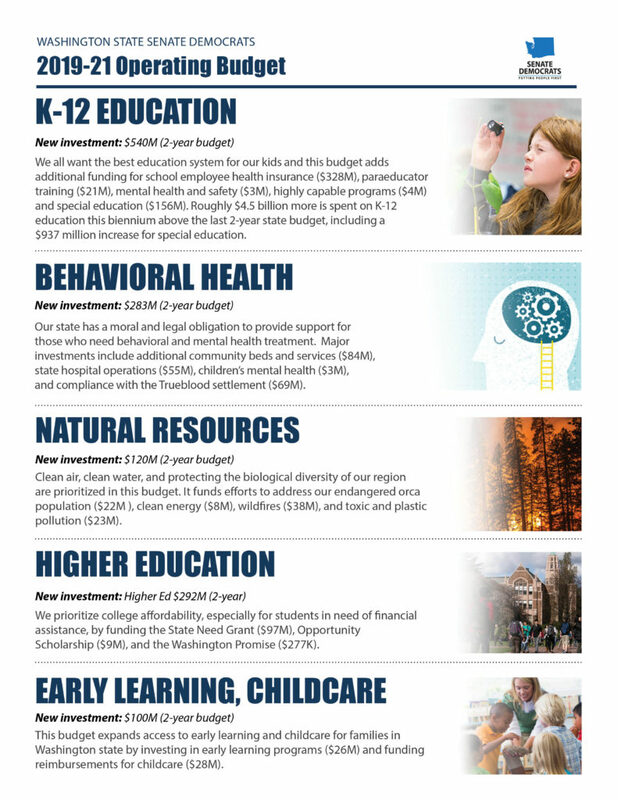 OLYMPIA – The Washington State Senate today approved a $52.2 billion state operating budget to fund vital state services, including targeted support for the state’s behavioral health system, K-12 special education, higher education, and the environment. Because the Senate amended ESHB 1109 before passing it, budget writers from the Senate and House must now begin a conference process to negotiate the differences in the versions that passed each chamber and pass a final operating budget before the end of the legislative session on April 28. Senate Democrats are proposing roughly $518 million in new revenue to pay for many of the new investments. The proposal calls for changes to make the Real Estate Excise Tax (REET) more fair and the closure or reduction of three preferential tax rates: non-resident sales tax, prescription drug resellers, and travel agents. The budget also includes a tax increase on property, auto and casualty insurance, from 2 percent to 2.52 percent, to establish a dedicated account to fund the growing cost of wildfire prevention and suppression. “Our economy is leading the nation is several categories, but our upside-down tax structure places a disproportionate burden on middle-class individuals. Where more revenue is needed to address our state’s growing needs, the budget strategy is careful not to increase the costs to working families,” Rolfes said. For this episode of the Everblue State, Sen. Manka Dhingra tells us about her path to the state Senate, what it’s like to be deputy majority leader, and why improving Washington’s behavioral health system is one of her priorities. Plus, she told us what it was like to make history as a woman of color in the King County Prosecutor’s Office and in the Senate.